The Save Bennachie Alliance (www.savebennachie.com/) is spreading the word about proposals for the A96 and the importance of preserving the landscape of Bennachie. In line with Scottish Government policy of dualling routes between Scotland's largest cities, Transport Scotland is currently progressing the programme to upgrade the A96 to dual carriageway standard by 2030. Of the four routes being considered near Inverurie, two would impact upon Bennachie and surrounding areas. Details of the routes along with a map can be found on our website. Route B and especially Route C would have a devastating impact upon the foothills of the Bennachie Massif. Whilst 2030 might sound far away, in fact the decision on the choice of route around the Inverurie area will be taken in a little over 2 years time. 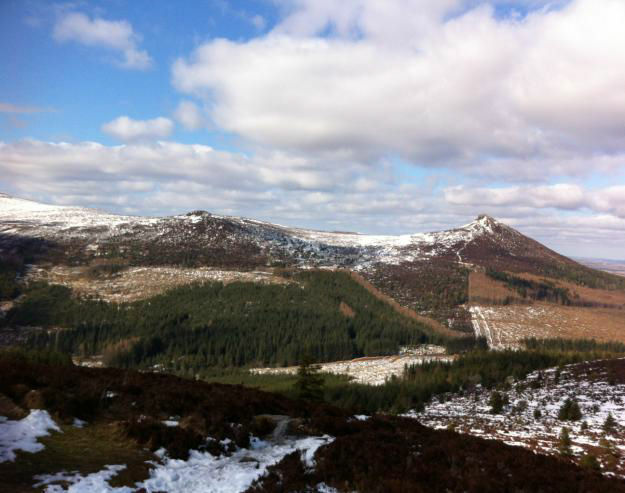 Formed in December 2015, the Save Bennachie Alliance is working to protect and defend Bennachie and its environs from any encroachment by the new A96 dual carriageway. Whilst respecting the decision to dual the A96, we aim to demonstrate, through positive means, the reasons why it would be wholly inappropriate to site it near Bennachie, whilst highlighting the massive opportunities which could be created by siting it to the north and east of Inverurie. Our strategy is to work positively with all parties associated with Bennachie and the Aberdeenshire area to influence as best we can any decisions in relation to the final routing of the A96. Amongst others, we are talking to community groups, business associations, stakeholders and interest groups. We have submitted our Preliminary Report to the Minister of Transport. Whilst talking to politicians of all parties at local and national level, our campaign is strictly non political and will last till the route is chosen. We will not stall or delay the implementation. Full details of our rationale can be found on the website. The Save Bennachie Alliance comprises an ever growing band of individuals and groups joining forces to stand up for Bennachie. We have held two very well attended public meetings and at the time of writing over 600 people have signed up to receive our Newsletters through our website, with over 2000 'liking' us on Facebook. The Alliance dimension is a vital aspect of the campaign. We are both delighted and extremely grateful to have the support of the North East Mountain Trust as a member of the Alliance, along with the Bailies of Bennachie, the Mountaineering Council of Scotland and local community groups. The more groups we have signed up and supporting the campaign, the more we will be listened to. That's why we are very keen on continuing to expand the membership of the Alliance. We are grateful for all offers of help! Sign up to receive our Newsletters via our website, and 'like' us on Facebook, follow us on Twitter. Please contribute to the blog and send in your photos and comments to our Facebook page. If you are a member of another group tell them about Save Bennachie, and encourage them to join the Alliance. Tell your friends about the campaign. We could use help in distributing our flyers to homes and businesses. If you have expertise which you feel could be relevant, we would be delighted to hear from you!